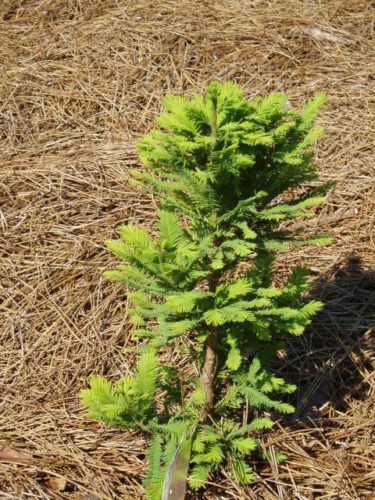 Taxodium distichum 'Pevé Minaret' is an amazing Bald cypress selection that grows like a miniature tree; even at 2 feet (0.6 m) tall, its branching mimics that of a mature wild specimen. It develops a main leader with dense side branches and grows with a very narrow habit and will stay much smaller and denser than the species. The terminal branch foliage becomes smaller and tighter toward the ends, creating the effect of tiny minarets. A grove of these would fit in a small garden nicely. After ten years of growth, a mature specimen will stand up to 6 feet (2 m) tall and 2.5 feet (0.8 m) wide. This is a tree that responds quite nicely to pruning. A common practice is to reduce all lateral branches down to 2 inches (5 cm) on a yearly basis. This practice will keep the plant tidy and increase the number of minarets throughout the plant. This cultivar originated as a seedling selected in 1990, by Piet Vergeldt, Lottum, The Netherlands from chemically treated seeds to induce mutations. This a selection made from the results. 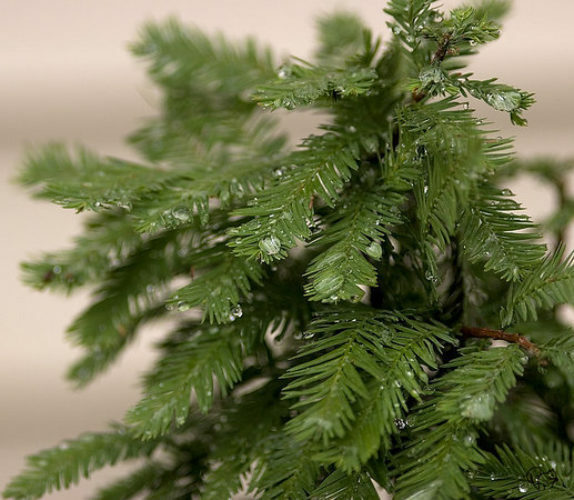 This was one of three plants selected in 2010 for the ACS Collectors Conifer of the Year program. Taxodium distichum 'Peve Minaret' The Harper Collection of Dwarf & Rare Conifers located at Hidden Lake Gardens in Tipton, MI. Photo taken August of 2005. 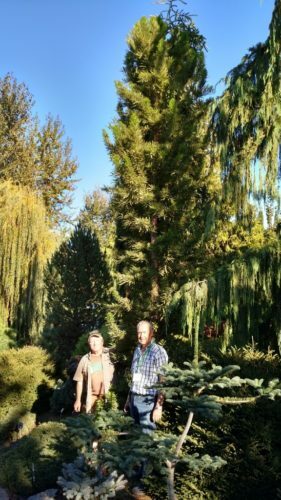 Piet Vergeldt (r) posing in front of a large specimen of 'Pevé Minaret' at the Oregon Garden conifer collection, Silverton, Oregon. On the left is Doug Wilson, the collection's curator.